Since Berry is backed by the Brothers Gibb, i.e. 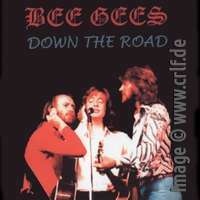 the Bee Gees, on this performance, audio copies of these segments were available in the Bee Gees collectors community on CDs. It wasn't clear, though, whether these CDs qualify for inclusion in our Chuck Berry sessionography database. We only include albums which have been commercially available and produced in quantities. This means we have all the official releases and the factory-produced bootlegs. It took a looong time to find out, but in the end we can now tell that these Chuck Berry recordings have been made available on what seems to be true, pressed CDs. One example is Down The Road (Drifter CD 022, 2009). While I haven't seen a copy yet, at least I have seen photos of the CDs.